Navigation Lesson 3 was my first flight since the transfer to JFC. Coming away from that lesson there was considerable feedback which I needed to seriously look at (its a common theme, right Mav). That lesson, and this one (15/10), were now some time ago and my over sleeping today and insomnia tonight provides the perfect opportunity to catchup on a blog post or two. Having taken on board the feedback from Wilson after Nav 3, I felt much more prepared, more familiar with the newer aircraft and far more relaxed. Knowing that the reward for a good flight would be my first Nav solo, the incentive to do well was there. The plan was to fly largely the same route as last time, Jandakot, Armadale, Victors 66, Clackline, Cunderdin, Corrigin, Beverley, Byford and back to Jandakot. From Cunderdin we’d not actually go to Quairading, but divert at low level to Beverley. Straight up, the biggest improvement was my flight planning. It seems to be considerably faster, from 4 hours down to about 2 :-p well so it seemed. Then the pre-flight of the aircraft was also quicker. The 13 drain points didn’t seem so bad this time and there was actually some fuel left in the tanks after I was finished. See, the later model Cessna’s have 5 drain points per wing, then 1 underneath the engine cowling for each tank feed, followed by one for the fuel injection. Departure, controlled airspace and the route to Cunderdin were all much easier a second time. I felt much more relaxed and largely enjoyed the trip up. On arrival at Cunderdin, we joined and did circuits. The traffic this time was considerably higher at the airfield, with no less than 7 gliders operating, the glider tow plane and numerous other General Aviation folks buzzing around. There were also regular Instrument Rating Folks flying through. We did 4 touch and goes and practiced non-controlled airfield procedures. There were a few gliders in the air and we had to share the circuit with 2 that were coming back to land and the tow plane launching another glider. From Cunderdin, Wilson had me track towards Corrigin, from there he pulled the power and we did a Practice Forced Landing. It was at this point I was feeling rather seedy, as the warm air was making the flight a little on the bumpy side, combined with the stress of navigation and the PFL. Wilson’s concern escalated when I asked if he had a sick bag handy, on the chance my lunch decided it wasn’t staying down. Given he had the IFR hood out, we discussed landing and taking a short break. On that we decided to back track to Cunderdin and land for a rest. 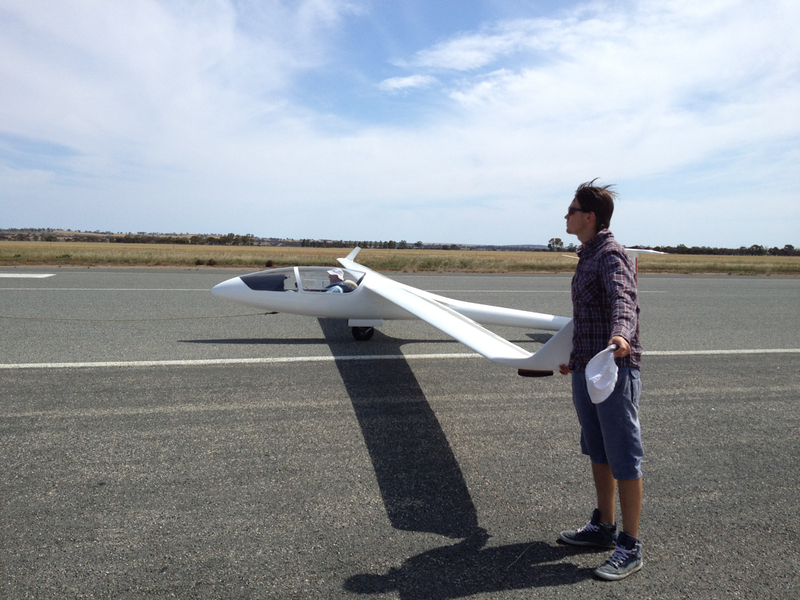 On the ground at Cunderdin, we parked off the runway near the gliders and wandered over to meet the strange folk that fly these aircraft. The first impression was not of the strategy pilots that lurk in the shadows of the old caravan, but the damn flies! They were everywhere! It seemed they would find their way to every part of your exposed body and annoy the b-jesus out of you! There may be logic to why the strange glider folk hid in the depths of their old caravan. The first thing you notice about the glider pilots is that they seemed quite normal. I thought this strange, given they like to fly planes without motors. However I was to learn in a little while, that these folks are like your every James Bond types, had little secrets… Anyway we were offered drinks and good conversation. It wasn’t long before I was feeling considerably better and had a good look around at the gliders. 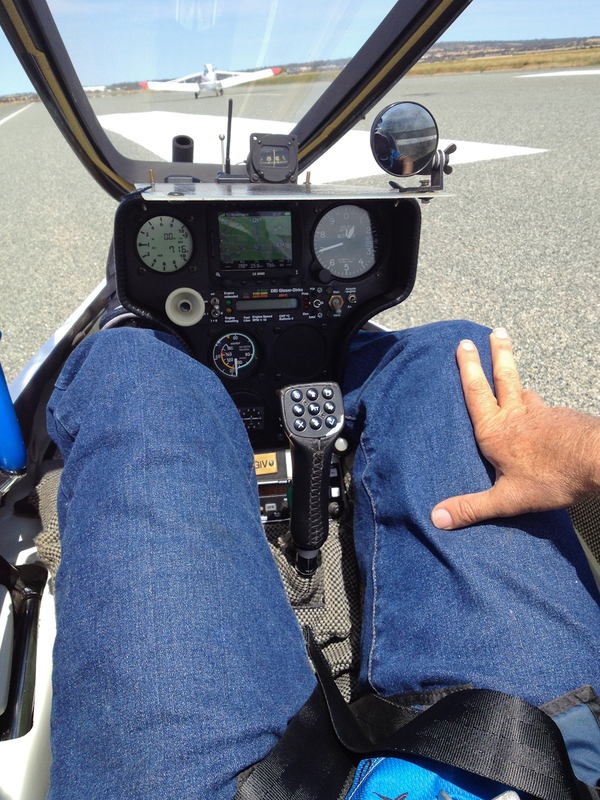 High tech glider cockpit. Solar powered with moving map. The James Bond glider is quite something. 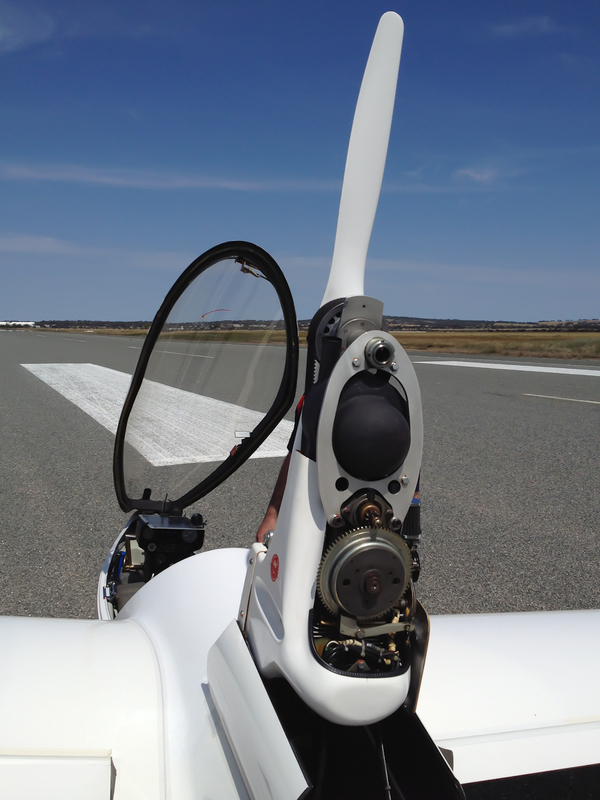 From the cockpit the motor can be deployed, started and operated. It is capable of taking off under its own power and of course sustaining flight one airborne, even when the thermals finish up. That day was the actual hand over of this aircraft to its new owner who paid a cool $150k for it (reduced from the $250k new price tag). The original owner was on hand to tell us about his achievement of having the Australian record for the longest (by time) solo flight in a glider in this particular aircraft, exceeding 8 hours. Pretty impressive given the motor was only used on that occasion to take-off. Overall, both Wilson and I were glad we stopped in Cunderdin and met these fine folk. They were extremely accommodating, even offering to take us up for a ride in the glider. We were also offered to head back up and get endorsed for the Tow Plane. This will be an offer that I might have to take up once my PPL is done. I can see a Sunday of flying up to Cunderdin, getting a good few hours towing the gliders up, then flying home late arvo. Would be a good day! After leaving Cunderdin, it was low level to Beverley and then home to Jandakot. On the way back we did some instrument flight and another PFL. Overall it was fun and I learnt a lot! Apparently Wilson was also in a good mood, he ok’d for me to do my first Nav solo the next day 🙂 Woo Hoo! 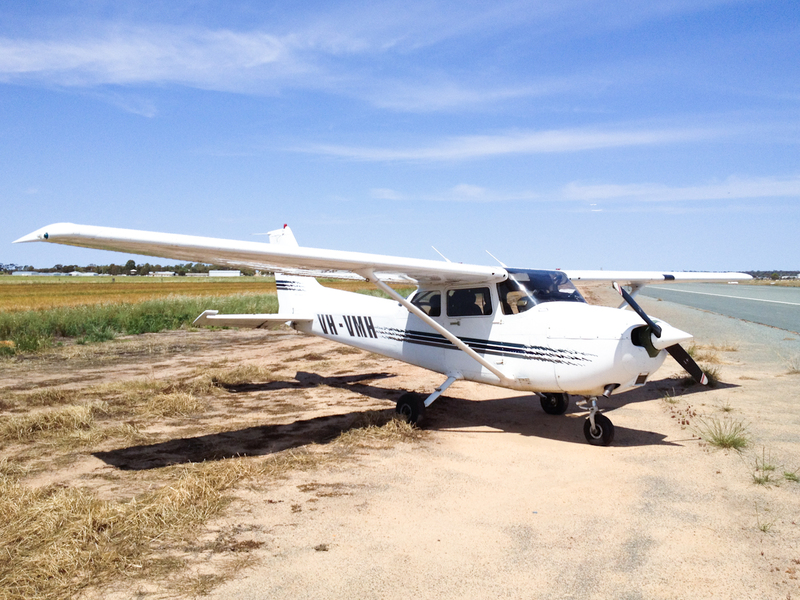 This entry was posted in Navigation, Pilot License and tagged aviation, C172, Cessna 172, Cunderdin, Cunderdin Airport, flying lesson, glider, glider motor, navigation, Plane, powered glider, VH-FSJ, VH-VMH. Bookmark the permalink. Once again mate, sounds like a good time was had by all. I must admit, heading out to Cunderdin never really sounded like an interesting proposal. Now however, I may have to consider a trip out that way in lieu of south, or Rotto. Enjoy the nav solo mate. As memorable as first solo circuit was, so to will be the solo nav, and making it home again. You’ll love it..
Good read as always mate.